The Order of The Benedictines of the Holy Spirt (OBHS) is a Benedictine religious order based in the United States at the Priory of St Louis of France, Salt Lake City, Utah. Membership is open to members of any denomination or none. The Prior says: "While there is much that could be said about the fascinating events of St. Louis’s life, I would like to focus on some of the examples of the extraordinary holiness he possessed. St. Louis possessed a great love and devotion for the poor and sick of his kingdom. He cared for his unfortunate subjects with extreme humility and compassion, founding hospitals and charitable institutions, and personally ministering to the poor. 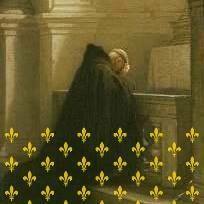 King Louis also loved prayer—especially the holy sacrifice of the Mass. He daily heard two masses, and while traveling, he would surround himself with priests chanting the liturgy of the hours. After being taken prisoner following a great battle, he recited the Daily Office with two priests and had the prayers of the mass read to him. The atmosphere in which he lived was one of prayer and recollection. In an age of great and holy kings, King Louis was undoubtedly one of the greatest. His humility, his love for Christ and his Church, his just rule, and his sacrifices on behalf of his subjects, all leave us an example of sanctity to be imitated. The old saying goes that power corrupts. But while having great power and wealth can undoubtedly be used for evil, King Louis demonstrated that it can just as easily be used for good. We desperately need great leaders and statesmen like King Louis in our own time— selfless men who are driven by accomplishing the will of God, and not merely by getting power for its own sake. We model or parish on the attributes of Saint Louis our patron." Rt. Revd. Terry Elkington, OSB Prior. Should you be interested in finding out about joining the order, please click here.